Iran put a ballistic Missile on display as thousands marched on Saturday to mark the anniversary of the 1979 seizure of the US embassy, with a senior official accusing President Donald Trump of a “crazy” return to confrontation with Tehran. Last month, Trump broke ranks with European allies, Russia and China by refusing to re-certify Iran‘s compliance with its 2015 nuclear deal with world powers, reached during Obama’s tenure. Under that deal, most international sanctions on Iran were lifted in exchange for Tehran curbing nuclear activity seen to pose a risk of being put to developing atomic bombs. Iran has reaffirmed its commitment to the deal and UN inspectors have verified Tehran is complying with its terms, but Iranian Supreme Leader Ayatollah Ali Khamenei has threatened to “shred” the pact if the United States pulls out. “All the governments confirm that the American president is a crazy individual who is taking others toward the direction of suicide,” Ali Shamkhani, secretary of the Supreme National Security Council, told a rally in Tehran, state media reported. “Trump’s policies against the people of Iran have brought them out into the streets today,” Shamkhani said. But the Europeans share US concern over Iran‘s ballistic missile programme and “destabilising” regional behaviour. Senior Iranian officials have repeatedly said that the Islamic Republic’s missile programme is solely defensive in nature and is not negotiable. 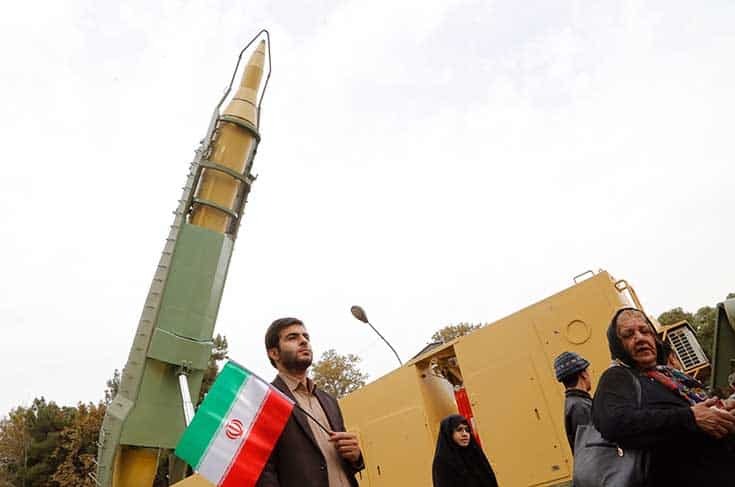 In a sign of defiance, a Ghadr ballistic missile with a range of 2,000 km (1,240 miles) was put on display near the ex-US embassy in Tehran, now a cultural centre, during Saturday’s street demonstration, Tasnim news agency said. “That America thinks Iran is going to put aside its military power is a childish dream,” said Brigadier General Hossein Salami, deputy head of its elite Revolutionary Guards which oversees the missile development, according to Tasnim. 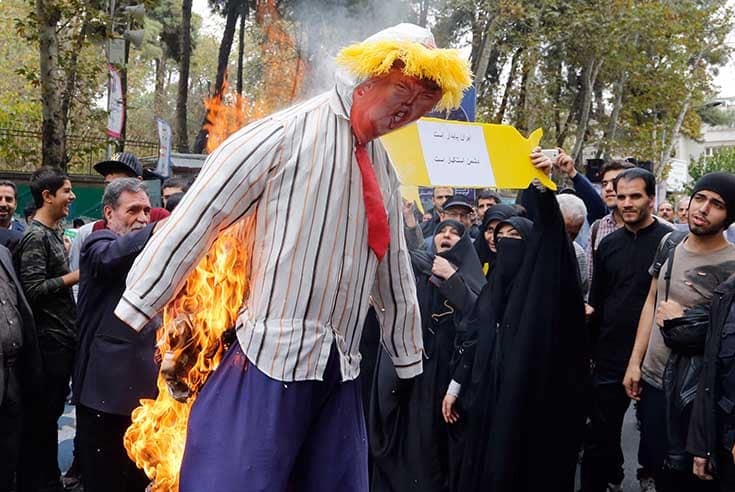 Fars news agency posted pictures of demonstrators nearby burning an effigy of Trump and holding up signs saying “Death to America”. Shamkhani spoke a few days after Khamenei said the United States was the “number one enemy” of the Islamic Republic. US-Iranian tensions have risen anew at a time when Tehran has been improving political and military ties with Russia. Iran and Russia are both fighting on the side of Syrian President Bashar al Assad against rebels, some of them US-backed, and Islamist militants trying to overthrow him.